Characterized by diverse geographic regions and climate zones, cities, towns and villages in Chile often are separated by difficult terrain and long distances, Sitting atop one of two colliding tectonic plates – the oceanic Nazca and continental South American – the Andean nation, as has come to be known worldwide, is also prone to cataclysmic earthquakes. Given all this, Chileans are increasingly recognizing, aand taking advantage of, the prospective benefits held out by renewable microgrids, including those in which solar-plus-storage are core elements. Italy’s Enel Green Power numbers among the players participating in Chile’s emerging “green energy” revolution. On May 31, the Rome-based multinational clean energy services company announced its Enel Green Power Chile subsidiary had commissioned “the world’s first 100% emissions-free ‘plug-and-play commercial-sized microgrid.” Relying on a combination of a 125kWp (kiowatt-peak) solar photovoltaic (PV) power generation and 580-kilowatt-hours (kWh) of lithium-ion battery (LiB) (132-kWh) and hydrogen energy storage (450-kWh), the all renewable microgrid is supplying part of the electricity needs of Enel’s Cerro Pabellón geothermal power plant in Chile’s northern Antofagasta region 24×7, management highlights in a news release. 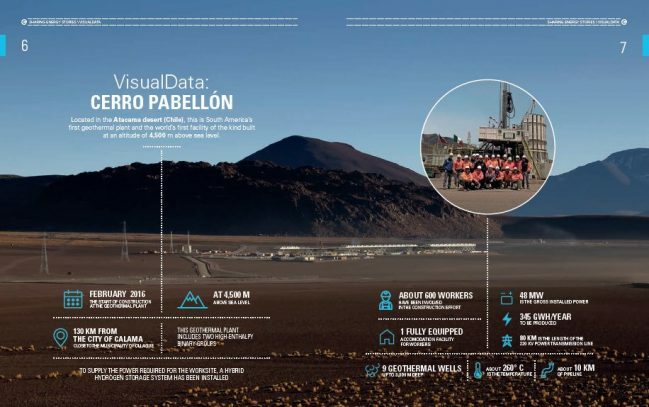 More than 600 technicians work at Enel Green Power’s Cerro Pabellón geothermal plant in the are of Ollagüe in northern Chile’s Antofagasta region. The province of Antofagasta borders the 1,000 kilometer (625 mi) long Atacama Plateau, the driest non-polar desert in the world, the Sahara being no exception. The Antofagasta region is also home to the vast bulk of Chile’s copper, which has long been the Andean nation’s primary export and source of foreign currency earnings. Sparsely populated, copper and other mining activities dominate the regional, as well as national, economy. Some mining companies active in the region have taken to tapping the region’s abundant solar energy resources to power their mining operations. Enel Green Power’s Cerro Pabellón geothermal plant at a stretch could be considered mining – mining for clean energy. 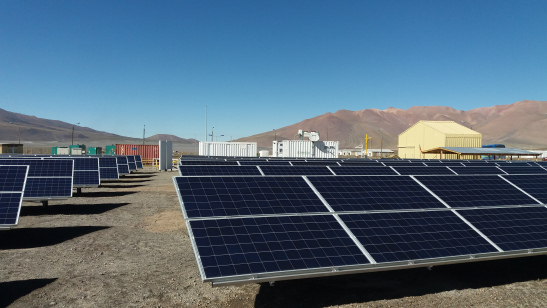 Tapping Antofagasta’s solar energy resources, and enhancing them with the addition of hydrogen and LiB energy storage capacity, adds to the company’s innovation and “green” energy credentials, as well as marking a world first. Enel Green Power Chile is the largest player in the Andean nation’s fast growing distributed renewable energy market and industry with a combined installed capacity of more than 1.1 gigawatts (GW). Of that, 564-MW is wind power generation capacity, 492-MW is solar and 92-MW is hydroelectric power, management highlights. Enel’s Chilean subsidiary just started producing electrical power from the 48-MW Cerro Pabellón. EGPC has just started producing energy – the first geothermal plant in South America and the world’s first high enthalpy, utility-scale geothermal plant to be built at such a high altitude – 4,500 meters (14,763 ft)above sea level. Antonio Cammisecra, who leads Enel’s Global Renewable Energies Division, highliighted the broad-based benefits and significance of the solar-plus-storage microgrid: “This groundbreaking project shows that it is possible to build fully renewables-powered micro-grids capable of delivering efficient, zero-emission energy without interruptions. France’s Electro Power Systems (EPS) was a key partner in the project. As reported by Microgrid Media, EPS has completed renewable energy microgrids in the Maldives and on Sardinia. EPS’ HyESS (Hybrid Energy Storage System) forms the core of Enel’s Cerro Pabellón 24×7 solar-plus-storage microgrid. As Enel explains: “[A]n innovative micro-grid controller optimizes the electricity flows produced by the PV modules making sure that such flows are efficiently shared between the two storage systems in order to guarantee continuous availability of the power supply. Solar, advanced energy storage and microgrid systems are beginning to gain traction in the residential and commercial sectors of Chile’s economy as well. An aggregator of “behind the meter” residential, commercial and industrial distributed energy resources (DERs) – rooftop solar PV, peak-demand energy storage, smart meters and data loggers – Amigo Solar is leveraging its Solar Electricity Network Platform (RES) to create intelligent renewable microgrids for home and building owners, business parks, industrial plants, shopping centers and other types of customers.